Organic Sales: 100% of the store sales are certified organic, with the exception of supplements and body care products. Annual Sales: Between $2.5 million - $10 million a year. Food and Thought informs vendors that their products need to be certified organic. All items in the store have to be 95% or more organic or they are not stocked. The store discontinues brands that do not meet their standards. The store tries not to stock any supplements or body care products containing GMOs, when alternatives are available. GMO products are not labeled, since all products are organic. 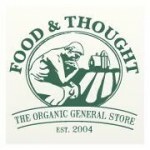 Food and Thought is a Non-GMO Project Participating Retailer.